Drone Wars is today publishing ‘Falling Short: An analysis of the reporting of UK drone strikes by the MoD‘. Since the beginning of air attacks against ISIS in Iraq and Syria (Operations Shader), the MoD has periodically published reports of the RAF strikes on its website. Law lecturer and member of the Drone Wars Steering Committee, Max Brookman-Byrne, has undertaken quantitative analysis of these reports and examined them in the light of international law. Nearly half of the reports do not provide sufficient information to make a basic determination as to whether the strike accords with relevant law. The presence of civilians has been airbrushed from the reports. It is suggested that each report should include a short statement about whether civilians were, were possibly or were not present in the vicinity of a strike. Inappropriate metaphors such as ‘hunting’ and the shorthand description of individuals as ‘terrorists’ or ‘extremists’ instead of providing an explanation as to why those individuals were targeted should be avoided. 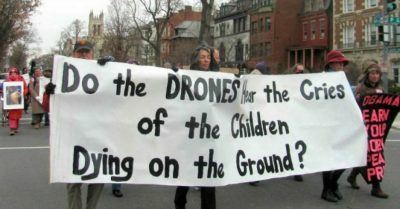 Only 4% of the reports of UK drone strikes mention civilians. Generally, these refer to a drone crew checking an area for civilians before firing, though others are less explicit, referring to, for instance, the ‘crew wait[ing] patiently until the targets were in open countryside’. In these cases it is clear that care has been taken to avoid harm to civilians and that precautions were taken, in accordance with the requirements of IHL. It is therefore highly concerning that the remaining 96% of reports make no mention of civilians. References to civilians demonstrates a number of things. First, where the facts allow, it shows that civilians have not been killed or hurt in a strike. Second, it demonstrates that the impact of a strike upon civilians is a key consideration when deciding to carry out a particular strike. Third, it creates the presumption that obligations under IHL have been taken seriously: that civilians are not targeted, that necessary precautions against harm to civilians have been taken, and that any incidental civilian deaths or injuries that occur are proportionate to the military advantage produced by a particular strike (the principle of proportionality). In order to improve transparency, it is suggested that each MOD report should include whether or not civilians were present in the vicinity of a strike, or whether it was unknown if civilians were in the area. While some strikes take place far away from civilian areas, others target urban areas where the likelihood of civilian casualties is much greater. The virtual air brushing of civilians from all strike reports together with the blanket assertion that there is ‘no credible evidence of civilian casualties’ (held until the recent acknowledgement of the accidental killing of a civilian) is not compatible with the volume of civilian casualty reports from on the ground compiled by groups such as Airwars. Transparency about the presence or not of civilians would increase the credibility of UK reporting. It cannot be presumed that civilians are simply not harmed by air strikes. These terms reflect the narratives presented in the media of the UK and US’s ongoing fight against global armed-groups. However, there is nothing within the term ‘terrorist’ or ‘extremist’ that indicates that a person is targetable under IHL. They are not legal terms, and, in the absence of additional facts, they do not indicate the reality of whether or not the person targeted in an air strike was a lawful target under IHL. That is not to say that those people are not targetable, but such a determination cannot be made without further information. Holding extreme views does not render a person liable to be killed, nor, necessarily, does membership of terrorist group. As the terms serve no real purpose in demonstrating the lawfulness of a particular air strike, it is unclear for what reason they are used, and who it is who decides whether a person killed by a drone was a ‘terrorist’ or an ‘extremist’. It is possible that the terms are being used to confer a sense of legitimacy to the public, implying that those killed deserved it, or perhaps that the terms are just in common use by those reporting the strikes. Whatever the reason, their use is questionable and undermines the ability of the reports to provide a transparent account of drone use and Operation Shader. While the MoD’s public reporting of air and drone strikes is to be welcomed and represents an attempt to provide transparency, it is currently falling short of what should be done in this area. We urge the MoD to improve its reporting in order to give greater public understanding and to improve accountability.